It could use some confederates! The trees in the background look cool from this angle. George Wallace stopped by tonight to visit the layout. George is an experienced O Scale modeler who was a founding member and former president of the O Scale advocacy Group O Scale Kings. He is a retired U.S. Air Force officer who flew F-105 Thunderchief fighter bombers in Vietnam and elsewhere. The "Thud" was one of my favorite USAF aircraft as a kid. After a brief introduction, George and I did a brief operation session. He ran the engine while I was the brakie. He was short on time so we didn't get to finish, but he got a good feel for the layout. I am now fairly certain that we'll need two man crews even though the trains are short. I recently finished reading two books that detail what life as a common soldier was like in the Civil War. The first was Detailed Minutiae of Soldier life in the Army of Northern Virginia, 1861-1865, by Carlton McCarthy. The second was Leander Stillwell's, The Story of a Common Soldier of Army Life in the Civil War, 1861-1865. Both are available free on-line from various sources such as project Gutenberg here and here. McCarthy served as a Private in the second company Richmond Howitzers, of Cutshaw's Artillery Battalion, in the Second Corps, Army of Northern Virginia. His memoir is more a general, somewhat romanticized view of what life was like for a southern soldier. It is not a strict chronological memoir like Stillwell's, but more a summary organized by topic, similar to the earlier book I reviewed, Hard Tack and Coffee: The Unwritten Story of Army Life by John Davis Billings, but from a southern perspective. The similarities in camp life between northern and southern soldiers was quite remarkable, though McCarthy does at times mention how they suffered more than their Union counterparts. The part of this book I found most compelling was the description of what soldiers did after the surrender at Appomattox as they walked home and looked for work and food. He also has an interesting side discussion on the origin of the Confederate battle flag. Stillwell's book is quite different in that it is a chronological memoir of his service in the 61st Illinois Infantry similar to Sherman's memoirs, but from the perspective of a young enlisted man and only covering the war years, not his whole life. Stillwell is a fantastic, and brutally honest writer. Though he penned this many years after the war, the details he remembers are incredible, though he does augment his memory with cites from the Official Records. Though a self-described country farm boy barely old enough to enlist and slightly built, his leadership skills and honesty quickly lead him to promotion to corporal, first sergeant and eventually company commander as a lieutenant. His story is matter of fact, with little of the self promotion and score settling you sometimes finds in memoirs. He later went on to become a judge and served for many years in Erie, Kansas and other locations including a stint in Washington, DC. The story is so well written and insightful that I think most general readers will enjoy it, but it is a MUST READ for anyone interested in civil war railroads. Stillwell's military service was intimately connected with the rail roads. His unit frequently was assigned to guard railroads, he rode them numerous time (as well as steam ships) across the south during his service to places like Shiloh, Corinth, Murfreesboro to Little Rock, AK. The last engagement he fought in was a running battle with confederate cavalry as his unit tried to defend a supply train to Murfreesboro in December 1864. This and his description of the battle of Shiloh are remarkable. Here is an except that I found very compelling. It demonstrates his style of writing as well as his first combat. I distinctly remember my first shot at Shiloh. I think that when the boys saw the enemy advancing they began firing of their own motion, without waiting for orders. At least, I don't remember hearing any. I was in the front rank, but didn't fire. I preferred to wait for a good opportunity, when I could take deliberate aim at some individual foe. But when the regiment fired, the Confederates halted and began firing also, and the fronts of both lines were at once shrouded in smoke. I had my gun at a ready, and was trying to peer under the smoke in order to get a sight of our enemies. Suddenly I heard some one in a highly excited tone calling to me from just in my rear,—"Stillwell! shoot! shoot! Why don't you shoot?" I looked around and saw that this command was being given by Bob Wylder, our second lieutenant, who was in his place, just a few steps to the rear. He was a young man, about twenty-five years old, and was fairly wild with excitement, jumping up and down "like a hen on a hot griddle." "Why, lieutenant," said I, "I can't see anything to shoot at." "Shoot, shoot, anyhow!" "All right," I responded, "if you say shoot, shoot it is;" and bringing my gun to my shoulder, I aimed low in the direction of the enemy, and blazed away through the smoke. I have always doubted if this, my first shot, did any execution—but there's no telling. However, the lieutenant was clearly right. Our adversaries were in our front, in easy range, and it was our duty to aim low, fire in their general direction, and let fate do the rest. But at the time the idea to me was ridiculous that one should blindly shoot into a cloud of smoke without having a bead on the object to be shot at. I had shot squirrels and rabbits, and other small game, in the big woods adjacent to our backwoods home, from the time I was big enough to carry a gun. In fact, I began when I was too small to shoot "off hand," but had to fire from a "rest,"—any convenient stump, log, or forked bush. The gun I used was a little old percussion lock rifle, with a long barrel, carrying a bullet which weighed about sixty to the pound. We boys had to furnish our own ammunition,—lead (which we moulded into bullets), gun-caps, and powder. Our principal source of revenue whereby we got money to buy ammunition was hazel-nuts, which we would gather, shuck, and sell at five cents a quart. And the work incident to the gathering and shucking of a quart of hazel nuts was a decidedly tedious job. But it made us economical in the use of our ordnance stores, so we would never throw away a shot carelessly or unnecessarily. And it was a standing rule never to shoot a squirrel anywhere except in the head, save as a last resort, when circumstances compelled one to fire at some other part of the body of the little animal. And so I thought, at the beginning of my military career, that I should use the same care and circumspection in firing an old musket when on the line of battle that I had exercised in hunting squirrels. But I learned better in about the first five minutes of the battle of Shiloh. However, in every action I was in, when the opportunity was afforded, I took careful and deliberate aim, but many a time the surroundings were such that the only thing to do was to hold low, and fire through the smoke in the direction of the enemy. I will say here that the extent of wild shooting done in battle, especially by raw troops, is astonishing, and rather hard to understand. Here is another passage detailing "taking the cars," the term he frequently uses to describe rail travel. This probably is a fitting place for something to be said about our method of traveling by rail during the Civil war, as compared with the conditions of the present day in that regard. At the time I am now writing, about fifteen thousand United States soldiers have recently been transported on the cars from different places in the interior of the country, to various points adjacent to the Mexican border, for the purpose of protecting American interests. And it seems that in some cases the soldiers were carried in ordinary passenger coaches. Thereupon bitter complaints were made on behalf of such soldiers because Pullman sleepers were not used! And these complaints were effective, too, for, according to the press reports of the time, the use of passenger coaches for such purposes was summarily stopped and Pullmans were hurriedly concentrated at the places needed, and the soldiers went to war in them. Well, in our time, the old regiment was hauled over the country many times on trains, the extent of our travels in that manner aggregating hundreds and hundreds of miles. And such a thing as even ordinary passenger coaches for the use of the enlisted men was never heard of. And I have no recollection now that (during the war) any were provided for the use of the commissioned officers, either, unless they were of pretty high rank. The cars that we rode in were the box or freight cars in use in those days. Among them were cattle cars, flat or platform cars, and in general every other kind of freight car that could be procured. We would fill the box cars, and in addition clamber upon the roofs thereof and avail ourselves of every foot of space. And usually there was a bunch on the cow-catchers. The engines used wood for fuel; the screens of the smoke-stacks must have been very coarse, or maybe they had none at all, and the big cinders would patter down on us like hail. So, when we came to the journey's end, by reason of the cinders and soot we were about as dirty and black as any regiment of sure-enough colored troops that fought under the Union flag in the last years of the war. When the regiment was sent home in September, 1865, some months after the war was over, the enlisted men made even that trip in our old friends, the box cars. It is true that on this occasion there was a passenger coach for the use of the commissioned officers, and that is the only time that I ever saw such a coach attached to a train on which the regiment was taken anywhere. Now, don't misunderstand me. I am not kicking because, more than half a century after the close of the Civil War, Uncle Sam sent his soldier boys to the front in Pullmans. The force so sent was small and the government could well afford to do it, and it was right. I just want you to know that in my time, when we rode, it was in any kind of an old freight car, and we were awful glad to get that. And now on this matter, "The words of Job are ended." The only railroad accident I ever happened to be in was one that befell our train as we were in the act of leaving Jackson on the afternoon of the 24th. There was a good deal of hurry and confusion when we got on the cars, and it looked like it was every fellow for himself. Jack Medford (my chum) and I were running along the side of the track looking for a favorable situation, when we came to a flat car about the middle of the train, as yet unoccupied. "Jack," said I, "let's get on this!" He was a little slow of speech; he stopped, looked and commenced to say something, but his hesitation lost us the place,—and was fraught with other consequences. Right at that moment a bunch of the 12th Michigan on the other side of the track piled on the car quicker than a flash, and took up all available room. Jack and I then ran forward and climbed on top of a box car, next to the tender of the engine, and soon after the train started. It had not yet got under full head-way, and was going only about as fast as a man could walk, when, from some cause, the rails spread, and the first car to leave the rails was the flat above mentioned. But its trucks went bouncing along on the ties, and doubtless nobody would have been hurt, had it not been for the fact that the car plunged into a cattle guard, of the kind then in use. This guard was just a hole dug in the track, probably four or five feet deep, the same in length, and in width extending from rail to rail. Well, the front end of the car went down into that hole, and then the killing began. They stopped the train very quickly, the entire event couldn't have lasted more than half a minute, but that flat car was torn to splinters, three soldiers on it were killed dead, being frightfully crushed and mangled, and several more were badly injured. The men on the car jumped in every direction when the car began breaking up, and so the most of them escaped unhurt. If the train had been going at full speed, other cars would have been involved, and there is simply no telling how many would then have been killed and wounded. On Saturday my mom and I took a trip to Historicon 2012, the annual Historical Miniatures Gaming Society summer convention. I presented my talk on "Introduction to the Railroads of the Civil War." The day was relatively cool so I wore my Union Brigadier general's costume. I did not bring any of the trains to display. The talk was well attended, and I suppose well received, though few folks laughed at my jokes. After the talk John Drye, the Convention Director, took me on a tour of the event. I used to be a regular attendee to this convention when I was an active gamer. I had not been to it in nearly twenty years. I must say I was floored by how big the show has grown. Over three thousand folks had signed up by Saturday morning and the registration line was 50 deep by lunch time. There were many games going on in the huge convention space, with WWII seeming to be the most popular, especially the World in Flames series. I wandered around and saw some neat games and I include some photos here. I also meet a lot of old friends and gaming buddies including Dana Lombardy, Larry Bond, Chris Carlson, Bill Lewis, and Bill Rutherford. I also had a brief chance to meet some new folks including manufacturers of the figures I use including Chris from Sash and Sabre, and Jeff from Old Glory. Greg Scott of GHQ and I discussed ACW modeling in N Scale and how it may improve once some decent engines are available. I also got to meet James Albrigtht of the Orphan Brigade Painting Service, the guy who has been painting figures for me. He had a batch of ninety 28mm Reneda and Perry figures ready for me to pick up. I had previously sent them to him to paint earlier in the year through John. 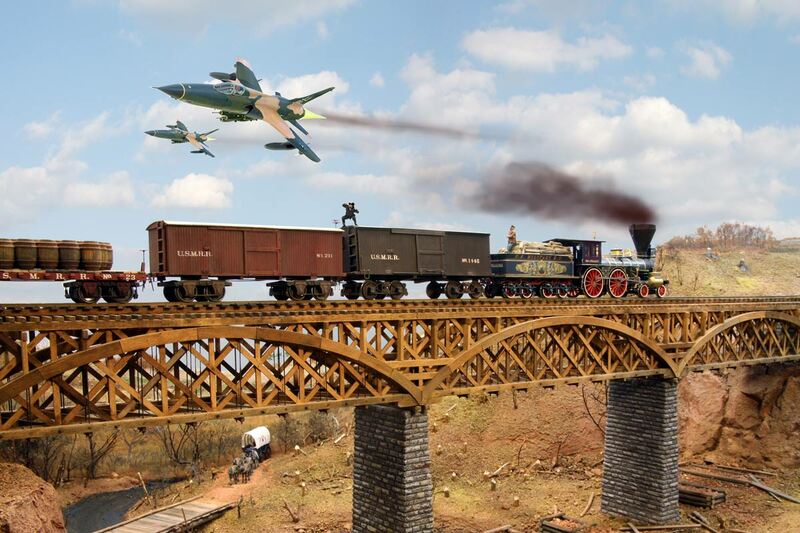 Bill Moreno from Miami, Fl hosted a 10mm game of Fredericksburg with dedicated terrain boards. different scenarios filling his garage. up a fortified rocky hill. On Sunday, my younger brother, Marco,visited. We did a small op session running a train from Brooke to Falmouth. We then switched out some cars at Falmouth and Stoneman's and headed back to Brooke. The layout ran well. Ninety more soldiers for the layout. These will depict a unit marching and one skirmish drilling. One of my flat cars has been troublesome. We noticed that the brake linkage was interfering with the frame. A washer on each truck screw to raise the body solved the problem. I am gradually modifying all my couplers to remove the internal backing plate. With the long links I am using, by removing the backing plate, the cars are able to push coupler face to couple face. We noticed that on tight curves with the backing plate in, the links can bind. The backing plates help when inserting the link as it prevents the link from sliding into the coupler. Marco suggested setting up a temporary staging track at Aquia to start more formal operation sessions. I have been considering this as I think begining operating might be a good objective for the winter. I had an interesting and fun visit with Paul Dolkos and two of his relatives on his wife's side, Prof. Edwin Combs and his precocious son, Marshall. Edwin is a professor of history at the University of Alabama at Tuscaloosa. He is very interested in the civil war, especially in southern industry during the war. He has done some archeological work on confederate ships in various river and bay locations. He and his son are both model railroad enthusiasts. Marshall is a lively and enthusiastic 7 year old. I was able to clear off the tracks and let Marshall run a train. The rails could have benefited from a cleaning after several months of no running and scenery work. But the trains did run and Marshall seemed to have a good time. Afterwards, he was chagrinned that my steel mill model had all the cars off the tracks and akimbo. This was a model I built for my steel mill modeling book. It had been ingloriously set on a table in the corner and largely ignored for the past two years. Marshall spent the later part of the night organizing and setting up the cars on this diorama. As they departed Marshall said, "It's a nice layout, but it could use some confederates." I replied, "Well, I could add some, but they would have to be prisoners." This was an aspect he had not previously considered and the look of surprise on the young boy's face was priceless. After they left, I was discussing the southern pine dilemma with my brother Rob in a phone call. As you may recall, he is the bonsai tree expert. I described how I am able to make a convincing armatures with wire, but was having difficulty capturing the look of the pine needle clusters. He suggested pipe cleaners. I had some bumpy chenille on hand from my N Scale Colorado modeling. So I tried soldering on short sections of cut chenille onto the wire tree frame. Since the trees had already been painted, getting the solder to stick was tricky. So I tried using hot glue. That was a little quicker process, but not as tidy. Anyway, the right photo shows the result of about 2 hours of this process. It is about half done. I am not sure this is the answer, but I will continue to finish this tree and evaluate it then. I adjusted some of the structures on the layout design, making Pioneer Mills and the Fitzgerald warehouse full size in O scale. When I do that I realize that Pioneer Mills is just too big for this layout. The revised drawing shows Pioneer Mills in full size O scale (122 by 112 feet footprint). I think it is better to have a couple medium sized buildings that were actually along Union Street than to try force a shrunk-down and improperly placed Pioneer Mills building into the layout. On the plus side, the G.A. Baldwin building is a cool looking building with some neat signs. Even these three and four story structures at about 12 to 15 inches tall in O scale should create the urban canyon effect we are shooting for. The Corn Exchange building which sits across Union Street from the Fitzgerald Warehouse was built in 1871, too late for the ACW. I will need to do a little more research to try to find out what the Civil War era building at that location looked like. 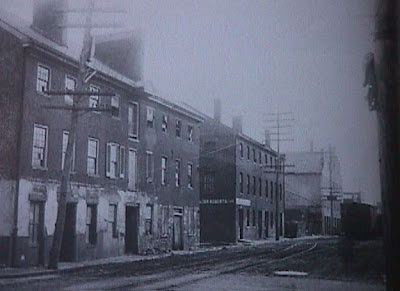 The Ramsey Building is kitty corner to Fitzgerald and is still there and currently a furniture store with the Fish market restaurant next door. It's neat typical colonial era brick building without any fancy architectural embellishments. The fourth corner now houses the Torpedo Factory art colony. The Torpedo Factory was built in the 20th century. The Baldwin buildings were replaced by a new building called "The Strand Building." In summary, two of the four corners have structures still standing from the Civil War era. It is interesting to note that Wales Alley, the narrow alley between Fitzgerald Warehouse and the smaller warehouse south of it is currently (2012) the scene of a huge legal battle between the Dominion Boat House, who claim an access easement on it, and a the city, who granted a restaurant permission to use the alley for outdoor seating. Mom at work in the sun room. My mom is spending some time with us and she was intrigued by the wire trees I have been making for the layout. She said she wanted to try making some. So I showed her how I have been making the trees. Then she sat in the sun room and made some for me. She used up all the wire I had on hand, so I went and bought some more so she can continue on her own while we are at work. She also made a pretty mean peach cobbler too. A batch of trees awaiting final painting and trimming. this somewhere on the layout. We had a mini work session on Saturday with John Drye, Jeff Peck and Christian Peck stopping by to work. John built some artillery using my laser cut kits, cast barrels and wheels. He was able to build 3 guns in about 2 hours. Jeff twisted wires which I later made into a complete tree. Doug Gurin stopped by later to eat some brownies and shoot the breeze. We also had two new visitors, my colleague from work, Dan Frisk, and his son, Joey. They stopped by to see the layout and attempt to repair the subwoofer from his stereo. While we had the soldering tools out we also fixed a broken lamp shade of his. Joey at 5 years old was not too impressed with the layout, but he did enjoy watching Clone Wars cartoon on TV. In the meantime we soldered in the new components into Dan's amp but they did not fix the problem. But we were able to fix the lamp shade. What do you want from two mechanical engineering graduates from MIT? After dinner John and I made some measurements in the basement and concluded that 18 feet long design in version 1 was just too big for the space I had available. My intent is to be able to set up the Alexandria scene in the media part of the room and use it as an extension of the main layout. The biggest layout that could fit in that space would be an L shaped 9 by 12. With those dimensions in mind, I set about compressing the first design for the Union Street Switching District to fit. See the version 2 plan. At this point it is more a representational model and not really an exact model of the waterfront. 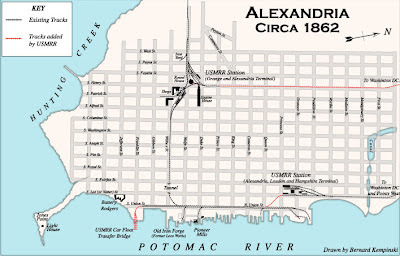 It tries to capture the feel and operation of the RR along the Alexandria waterfront in a space one sixth the length. However, it does include the key features I want to model such as Pioneer Mills, Wilkes St tunnel, gas works, car ferry and the "urban canyon." The structures along the street will be the strictly freelanced in regard to location, though individual buildings will be based on actual prototypes. When set up in the basement, the AL&H Staging track will be used. In shows both the O&A and the AL&H staging tracks could be used. These are fiddle tracks that could be possibly hidden behind the backdrop. Some of you may note that this plan uses a foot print very similar to the HO Alexandria plan I included in an article for RMJ in October 2002. You can find an on-line copy of that article here. Gerry and I have been discussing the construction of a ACWRR Road Show. The Road Show would be a portable O Scale layout that would promote railroading in the Civil War period. 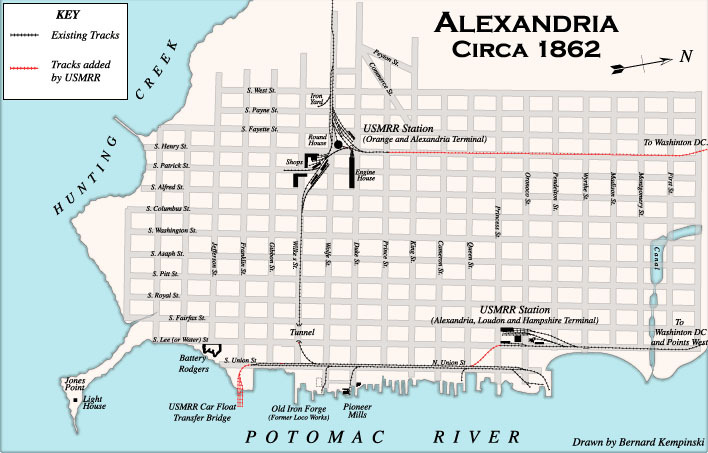 After some discussion we narrowed the subject to the Alexandria waterfront, specifically the Union Street Switching district. By looking at maps of the area and visiting, especially during some of my runs down Union Street, I realized that the street is actually a block or two from the waterfront bulkhead with many buildings between the tracks and the water. At the time of the Civil War most of the wharves and piers are perpendicular to the tracks. (Now some of the piers are parallel to the shore). I also realized that the street was fairly narrow with relatively tall buildings on each side. It is a small "urban canyon" even in 1860s. That got me thinking about how an O scale layout could focus on the street and pretty much ignore the piers. This is both a plus and a minus. On the minus side, I would not get to build any more ships for the layout. One the plus side, I would not have to build any more ships for the layout. This project would also give me an opportunity to try my hand at urban modeling, especially brick buildings, something not on my current layout. I made this map by compositing together several of the Quartermaster maps I photographed at the archives. Here is a plan I am considering. until it burned in 1897. It is a simple, but signature structure. I colorized this B&W photo and did a little perspective correction. This plan is highly compressed and is not a exact model of Union St. As I mentioned in an earlier post, that would take way too much space. I selected the elements that I liked including the Wilkes St Tunnel, Pioneer Mills, King Street and the gas works. Pioneer Mills was one block away from Union Street. But, it is was a signature building in Alexandria and someday I would like to build a model of it. Note that it was not in use during the war. Some maps show the siding to the mill while others do not. So I am not sure there was one at the time of the war. 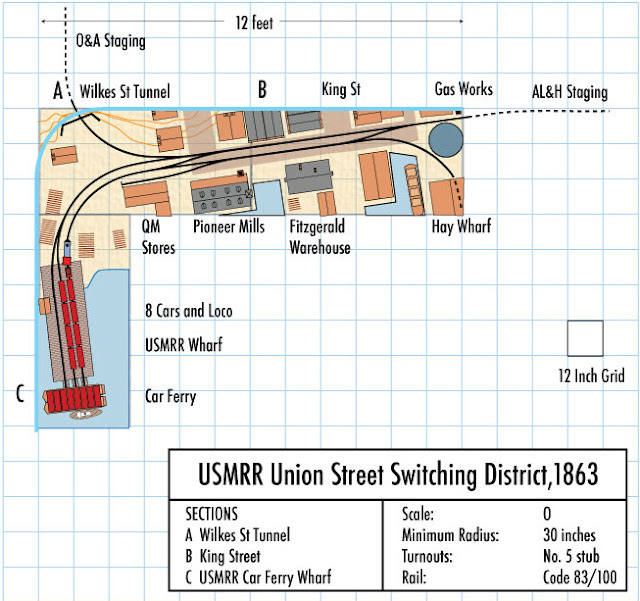 The USMRR car float ferry section is optional. The approach tracks to it could stand in as the staging tracks for the car ferry if there wasn't time to build it. Section A could be modified to omit the curve to teh car ferry. Then the the car ferry wharf could be built on a fifth 3 x 6 section. Since this is the northern terminus of the car ferry operation that served the USMRR Aquia Line, the layout could be built as an "expansion" to my current layout. My research indicates that usually only one ferry left Alexandria for Aquia per day. But there were ferries to other locations from here, so the Union Street district could be pretty busy. 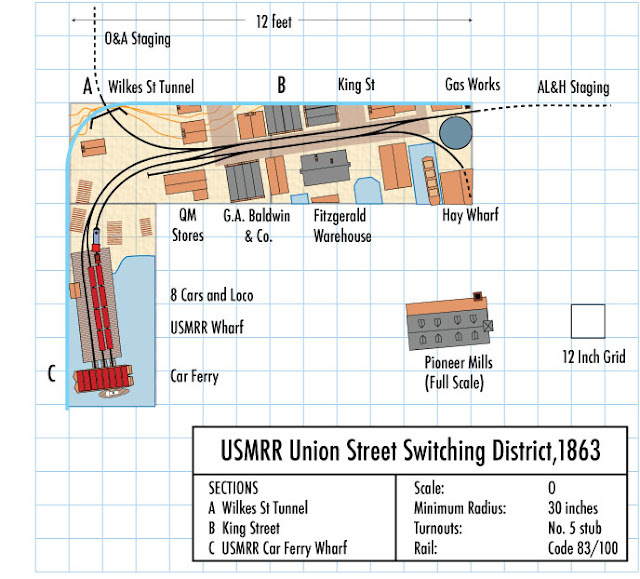 The USMRR built the track connecting the AL&H with the O&A's Union St district. This allows for staging/ fiddling at both ends. The north end of the layout includes some of the industries and structures just barely visible in the photo below. The gas works in particular is something that intrigues me. The maps indicate that the gas tank would be about 50 or 60 feet in diameter, not too big even in O scale. Note the line of box cars at the USMRR Hay Wharf. The gas works is a neat "modern" touch. Dave at SMR Trains sent me some photos and artwork for the next locomotive he is producing, a Rogers 4-4-0 based on the W&A Yonah and NYC Amenia. He has the pilot model on hand and it is seen in the photo above. I don't have my copy yet. However, through the miracle of Photoshop, I inserted the model on my layout. Dave gave me the opportunity to order mine custom printed. I selected the the USMRR Osceola. The Osceola was a 1848 Rogers locomotive that served on the USMRR Aquia line. It is very close to the Yonah in terms of physical descriptions. I do not have a photograph or builder's drawing of the Osceola, so the stats are all we have to go by. Not knowing what the exact paint scheme of the Osceola was, I used the USMRR Nye as a basis. Below is my artist concept of what the lettering will look like. This model will be my first SMR Trains engine with the motor powering the main drivers from a boiler mounting. All my previous models were tender driven. I am looking forward to adding it to my roster. For those that model the Andrews Raid and the Great Locomotive Chase, you are just about set in terms of the locomotives you will need as SMR did the General,Texas and now Yonah. Of course some are sold out.